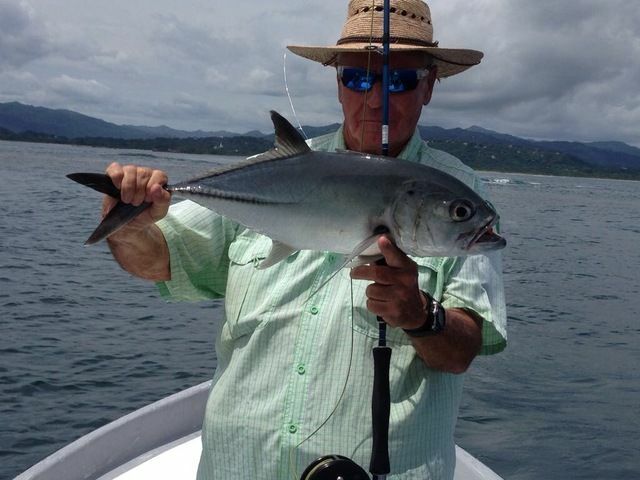 The Adventurer stayed on the bite with some nice Jack Crevelles including the rare Blue Jack Crevelle, all caught on fly-tackle by angler Russ Hampton. 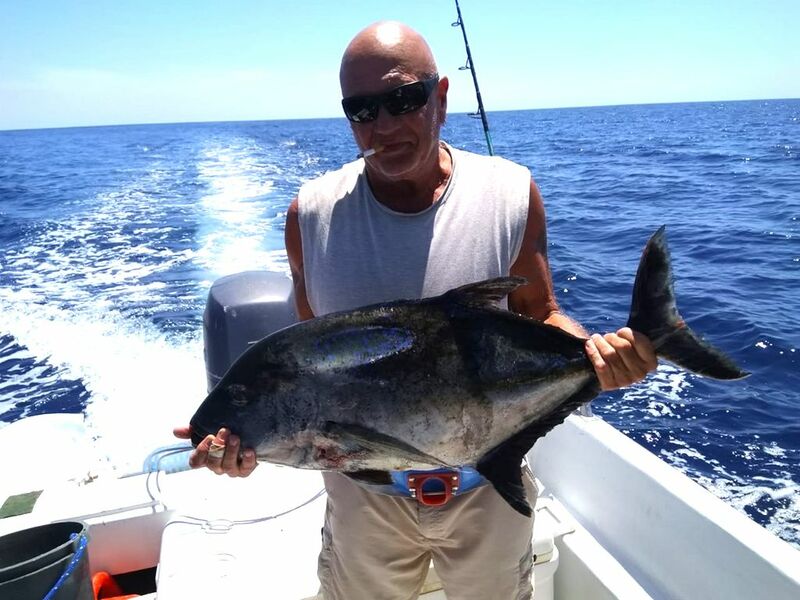 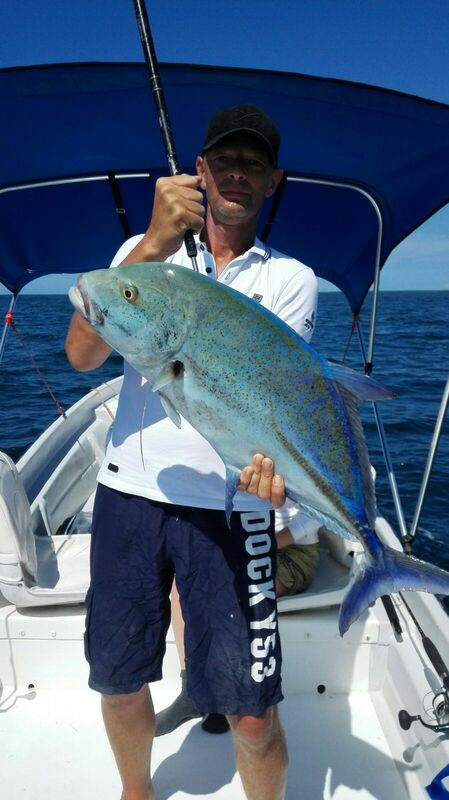 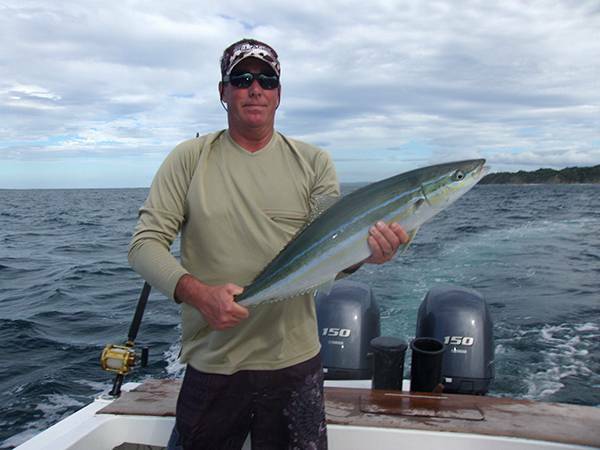 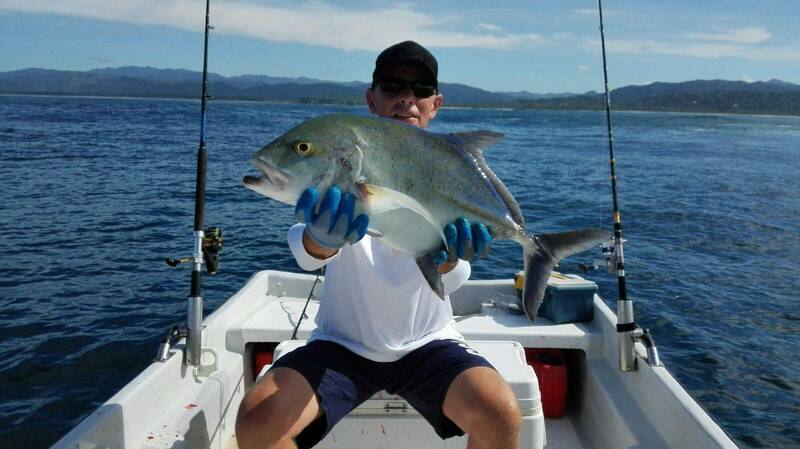 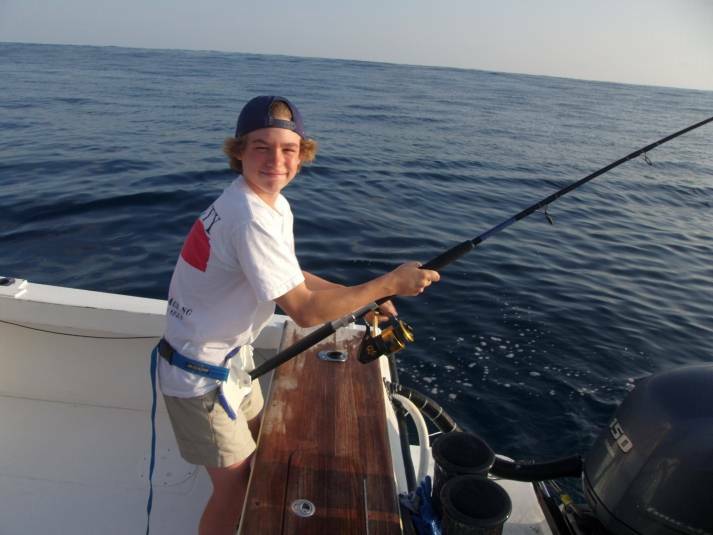 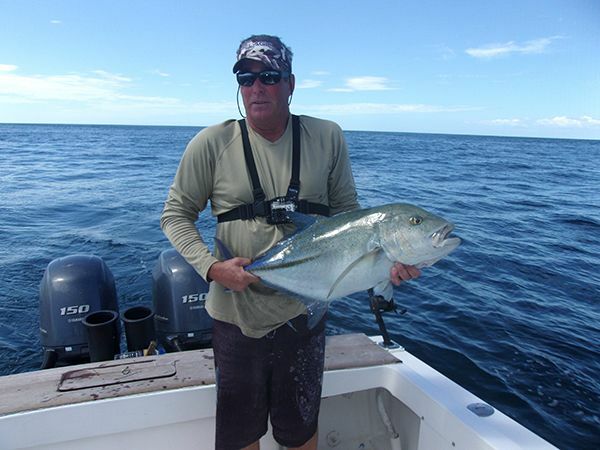 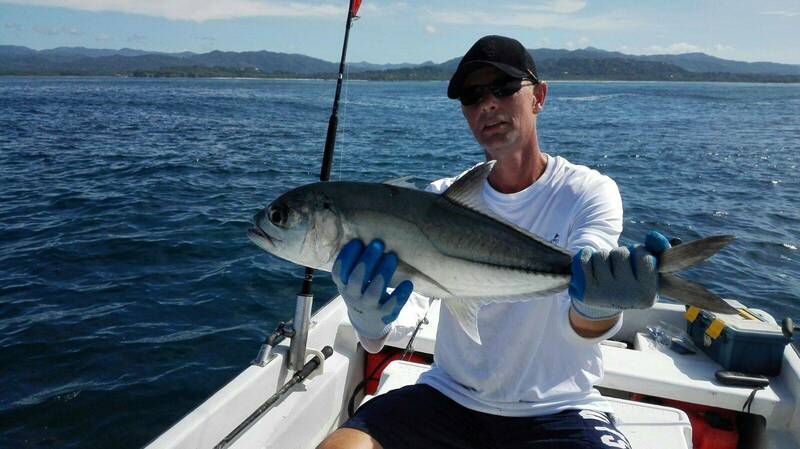 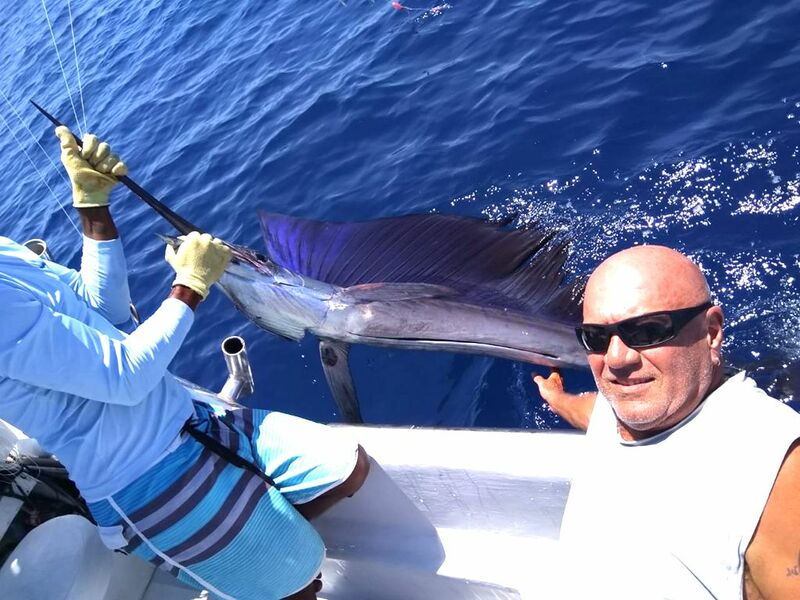 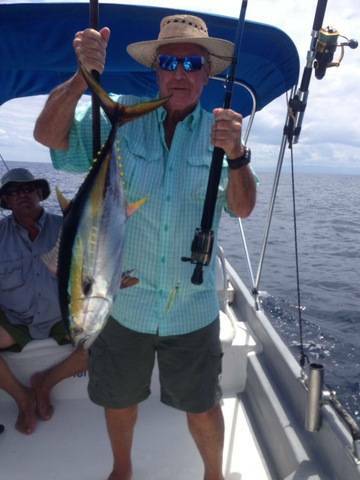 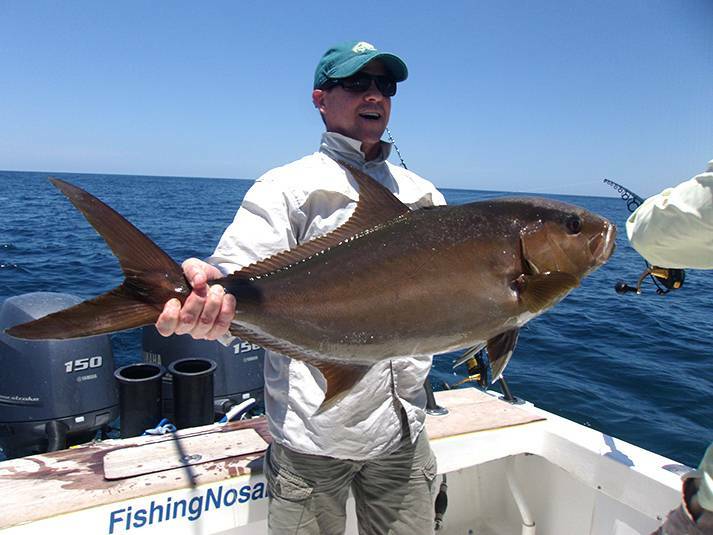 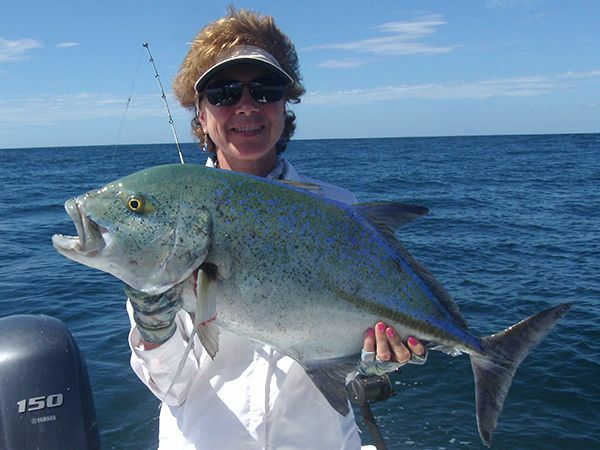 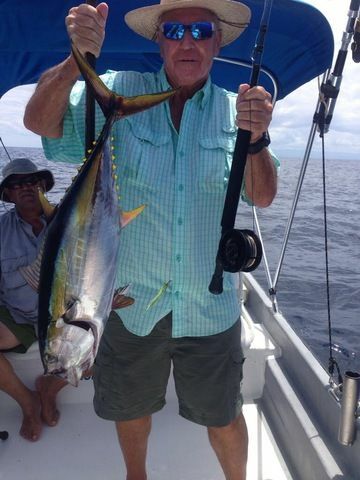 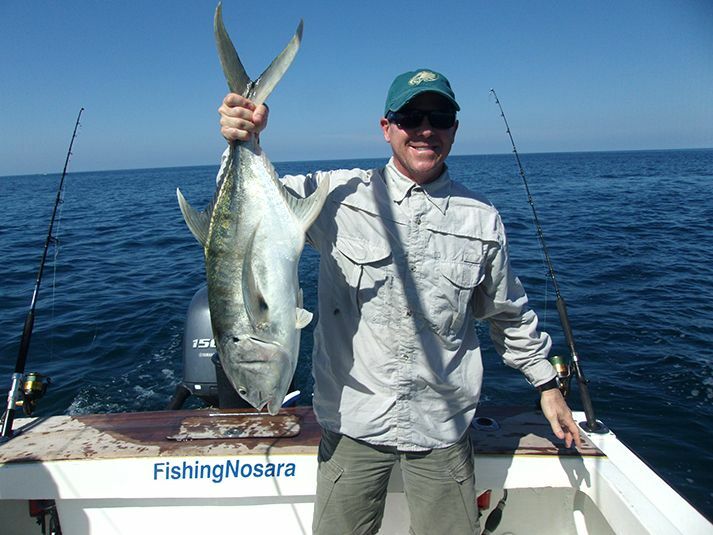 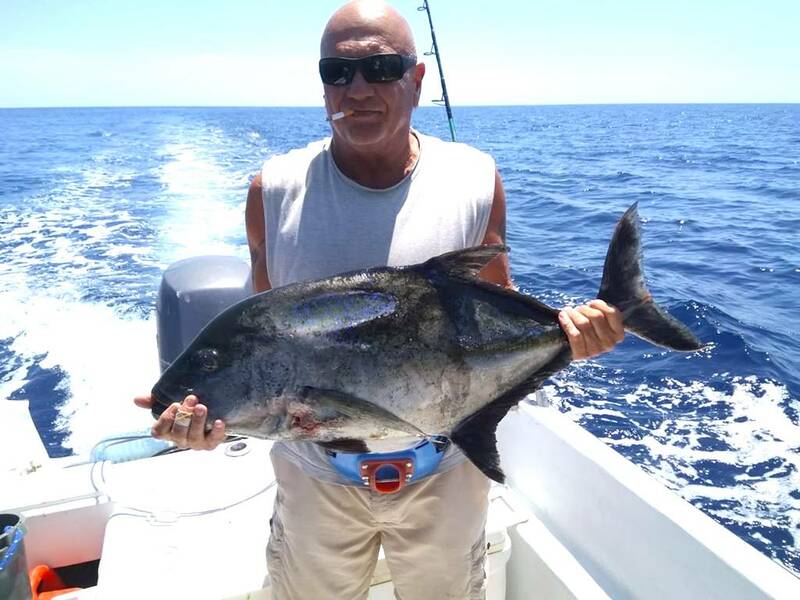 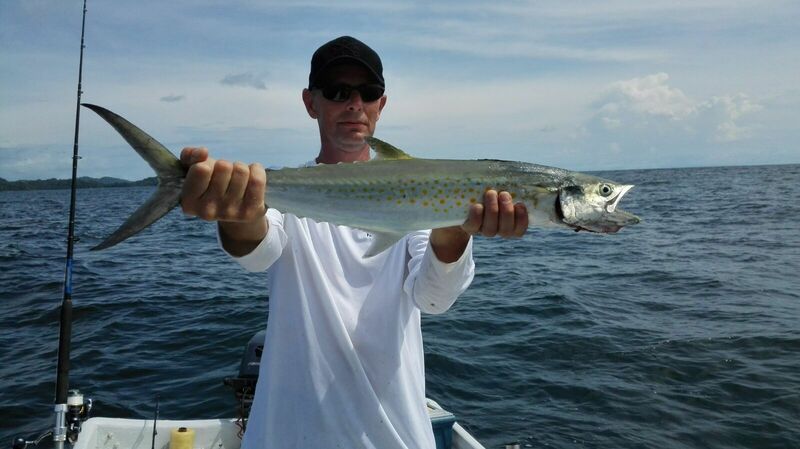 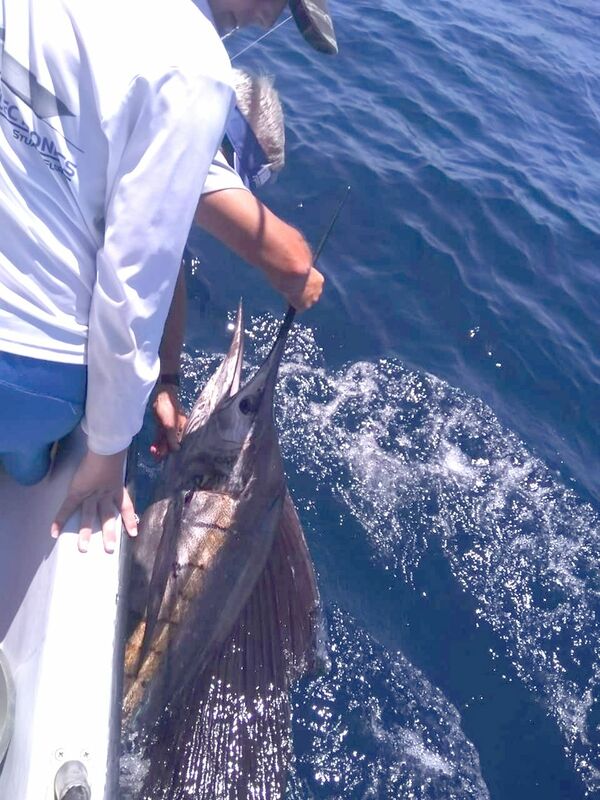 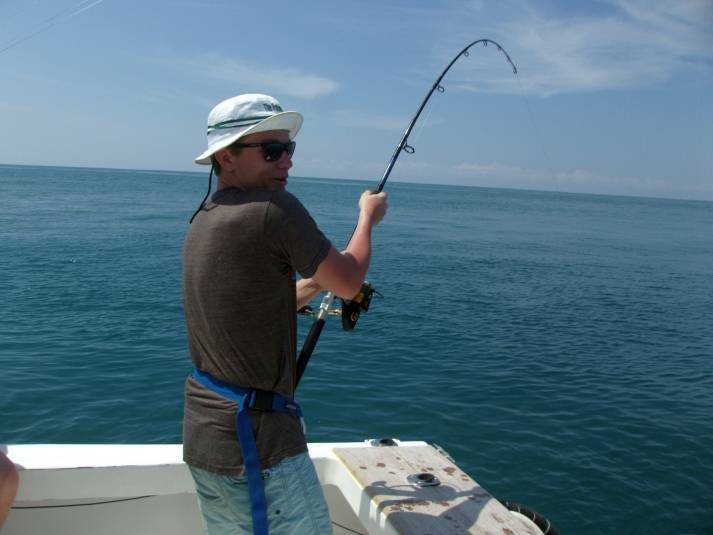 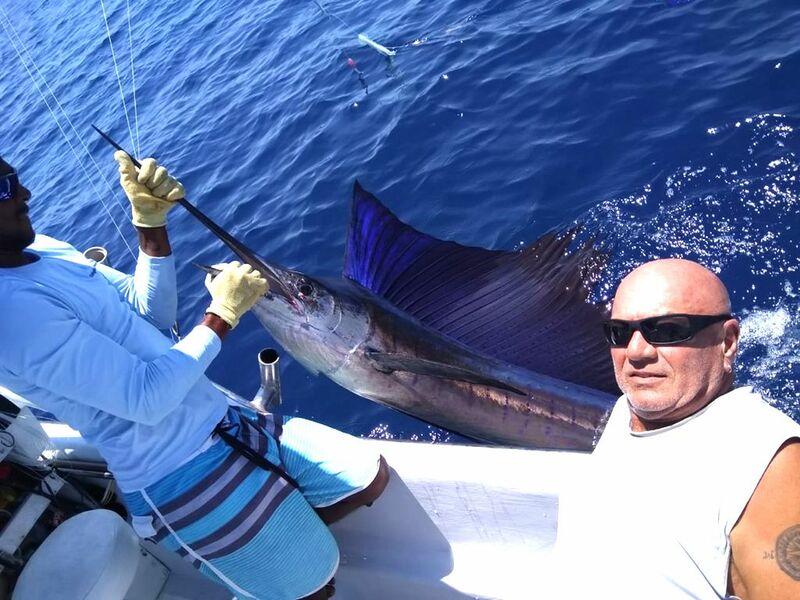 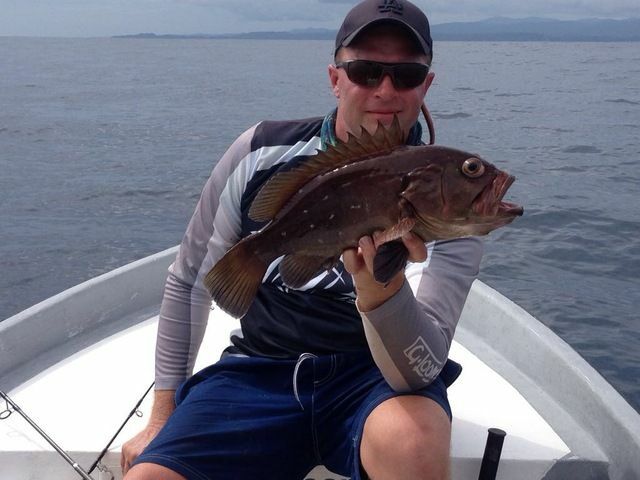 Captain David finished the month strong with more great catches on the Adventurer. 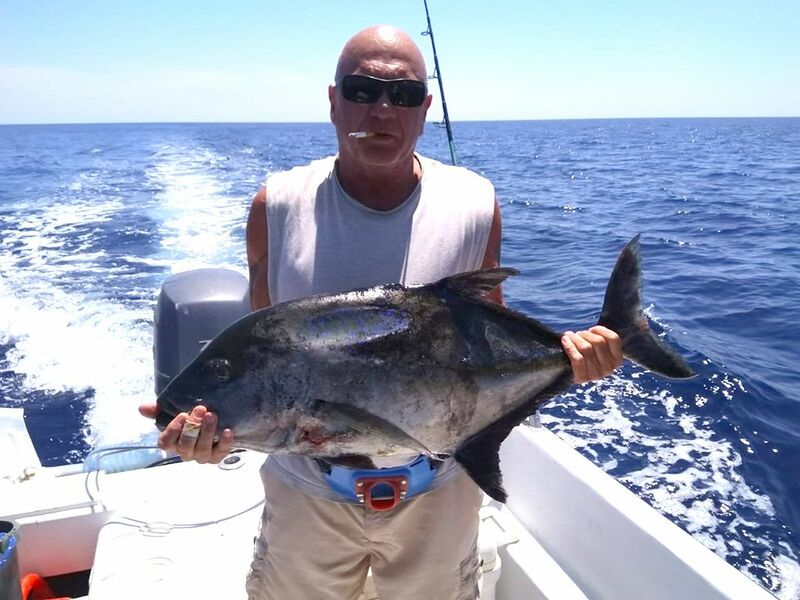 After some nice Yellowfin Tuna scores with angler Russ Hampton (above), the switchblade pried up a groovy little Grouper and a curious member of the Jack family. 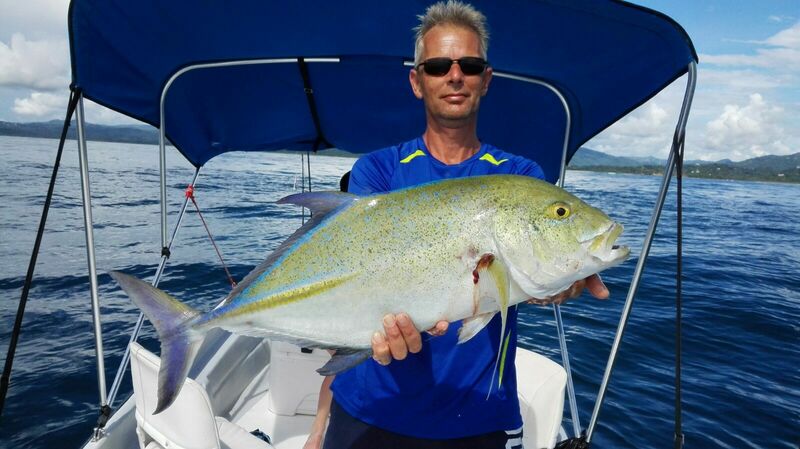 We were stoked to welcome some new European friends for a week of great inshore action on the Adventurer. 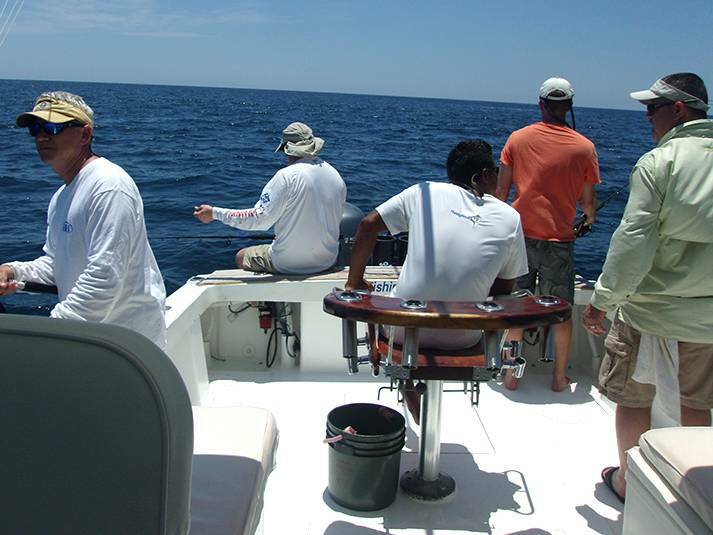 These hard-fishing folks found us through Tightlines NL and brought their ‘A’ game to the waters around Garza Bay. 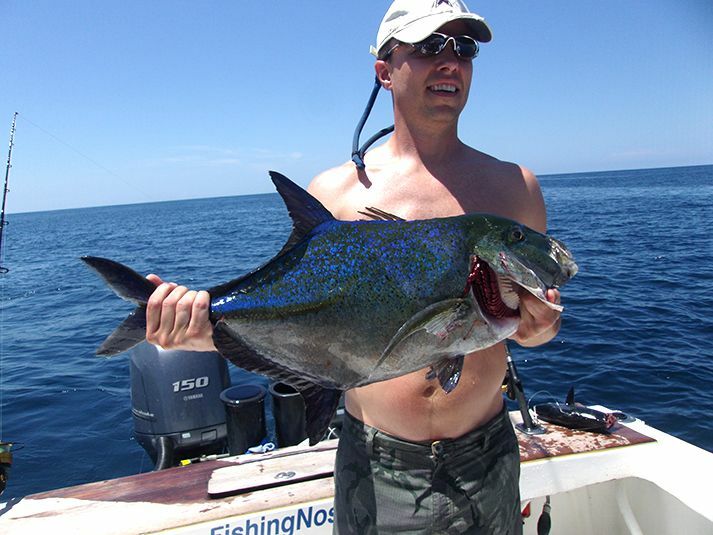 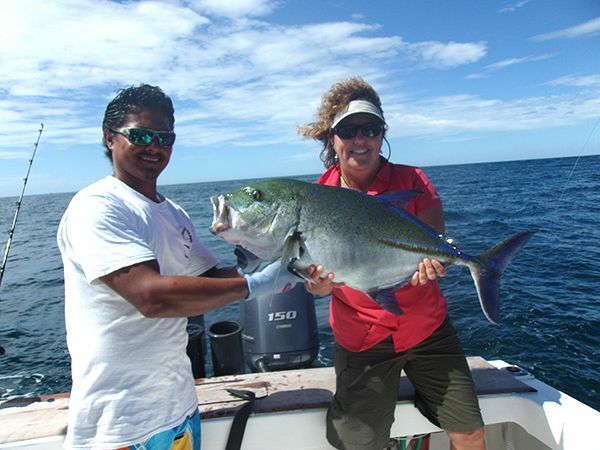 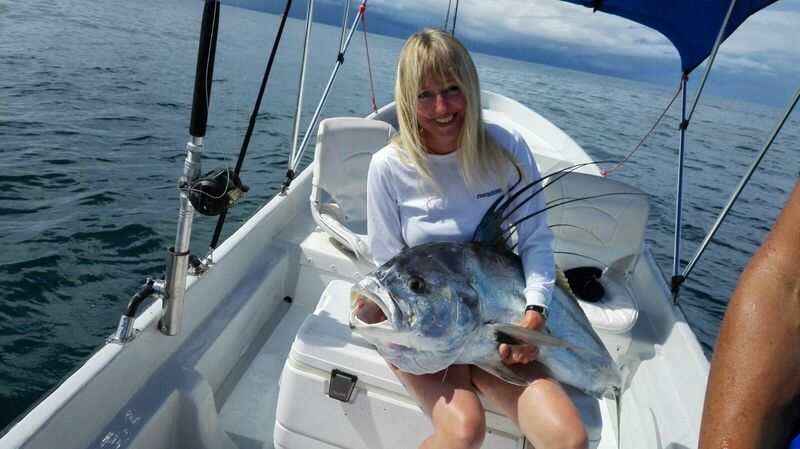 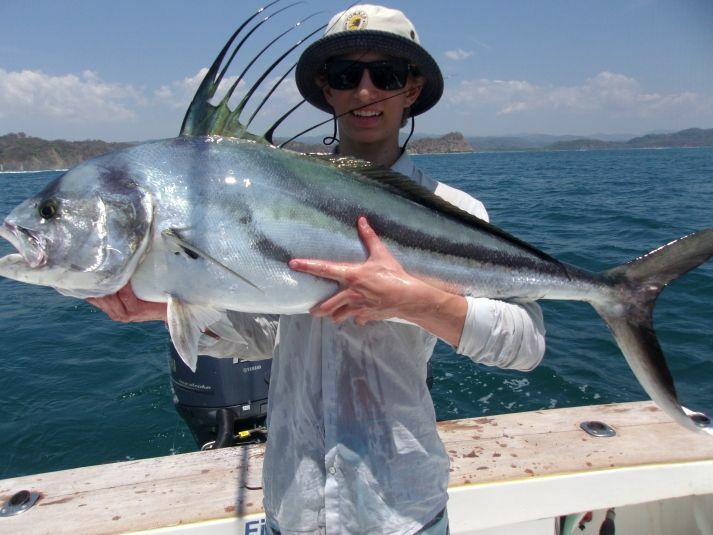 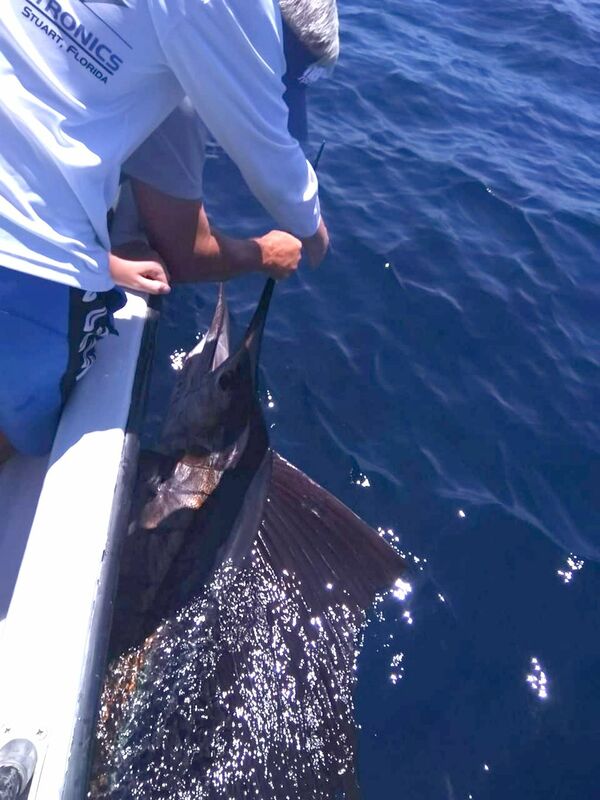 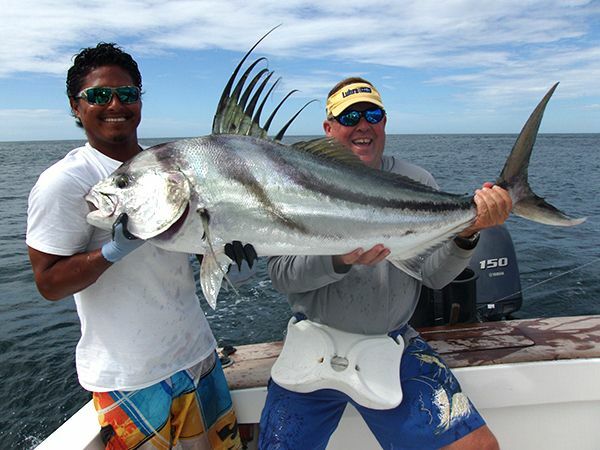 These big Rooster fish releases were a sign of great things to come. 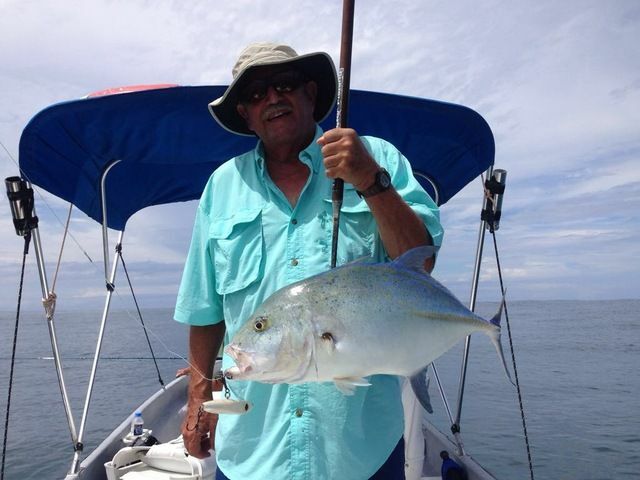 Their haul included lots of Spanish Mackerels, Jack Crevalles, and the ultra-rare Blue Jack Trevelly. 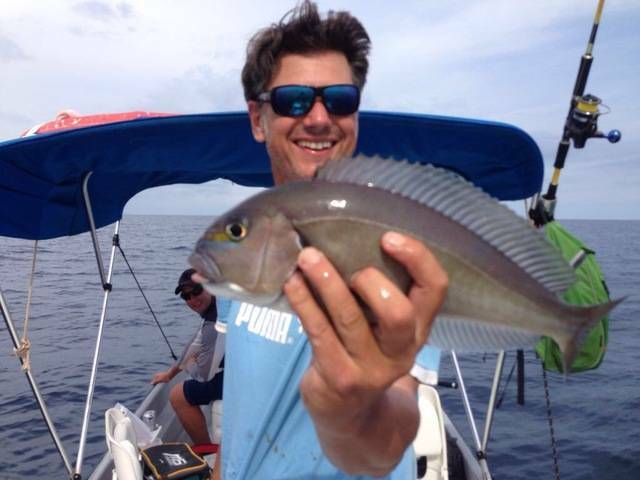 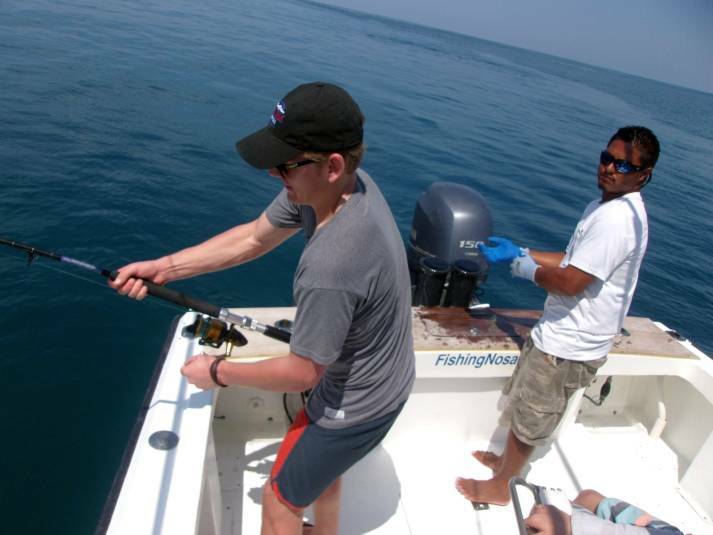 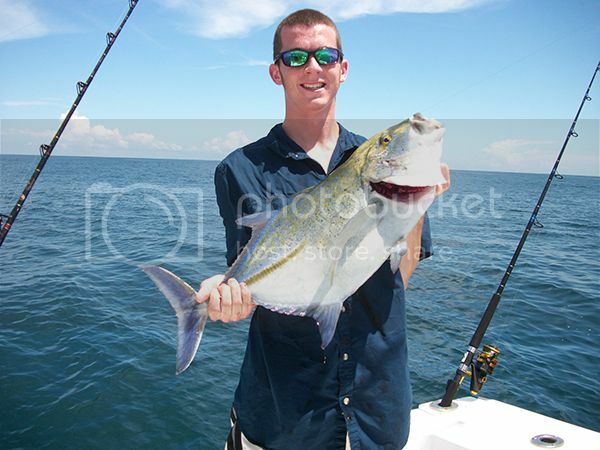 The inshore madness continued on April 2 as the flagship pulled myriad species of fish up from the shallow reefs. 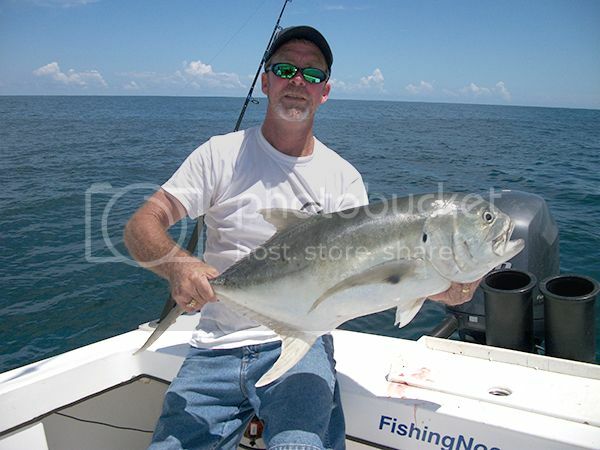 Fresh of his great river mouth scores of Snook, client Mike Loughrey and his group scored Jack Crevelles, Amberjack, and the elusive Blue Jack Crevelles. 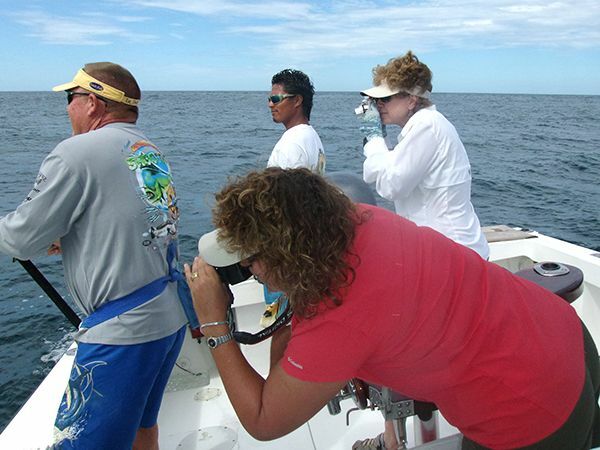 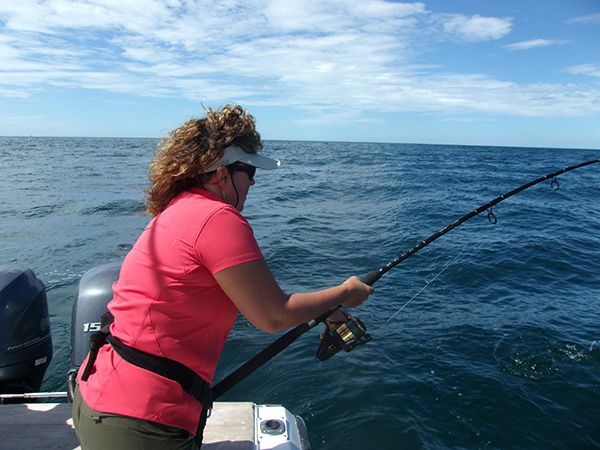 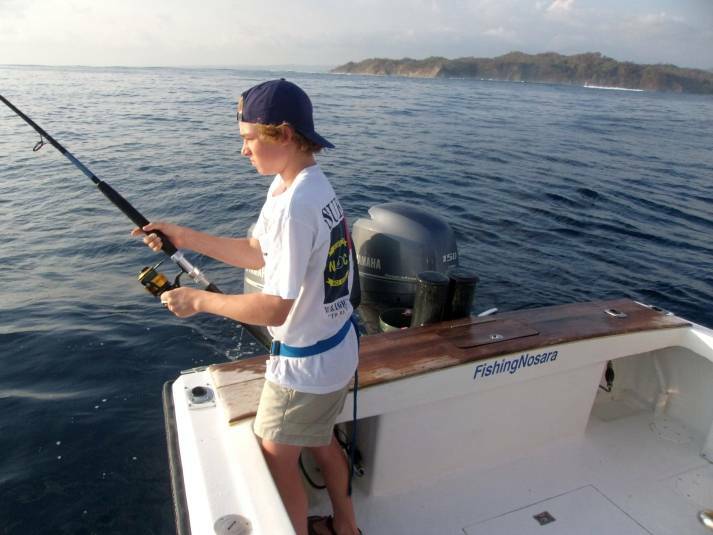 Inshore madness on the March 24 on-board the Wanderer! 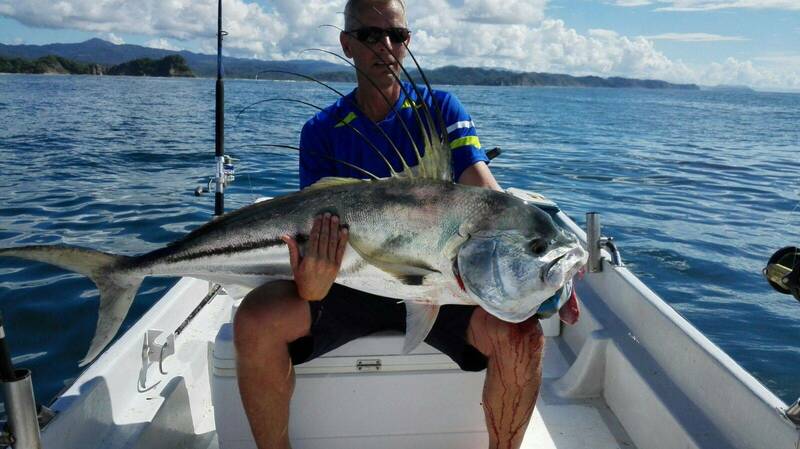 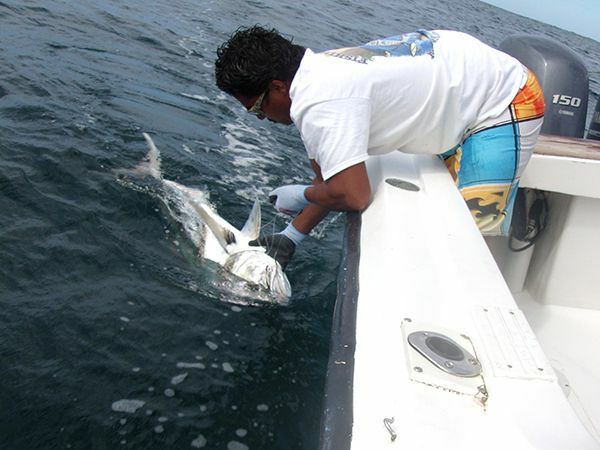 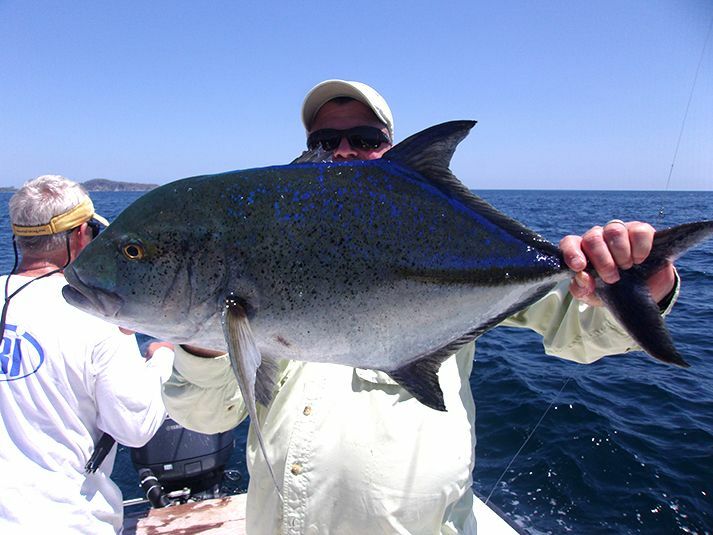 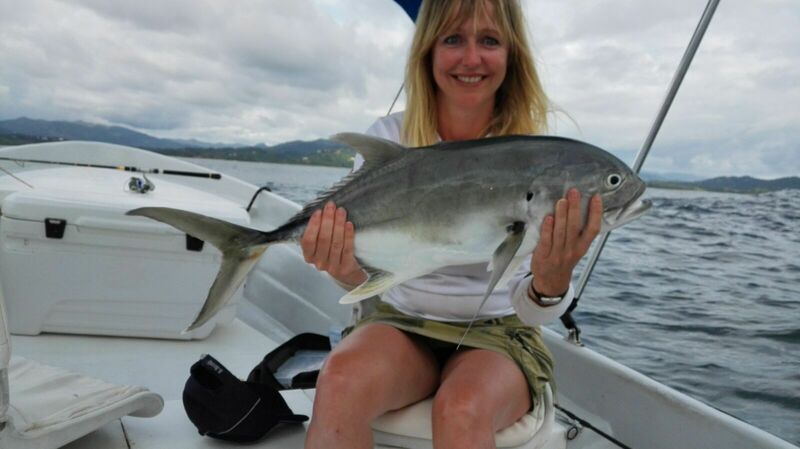 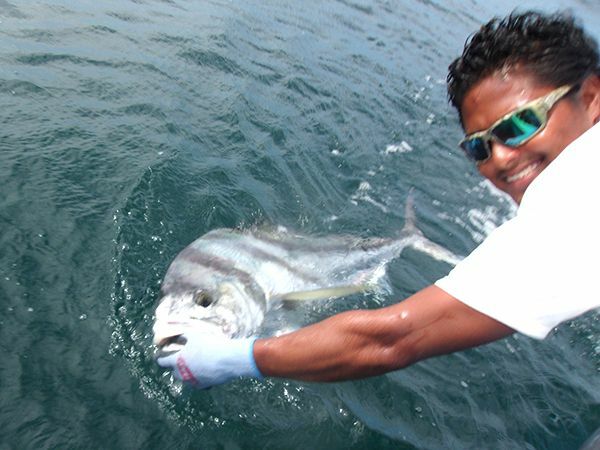 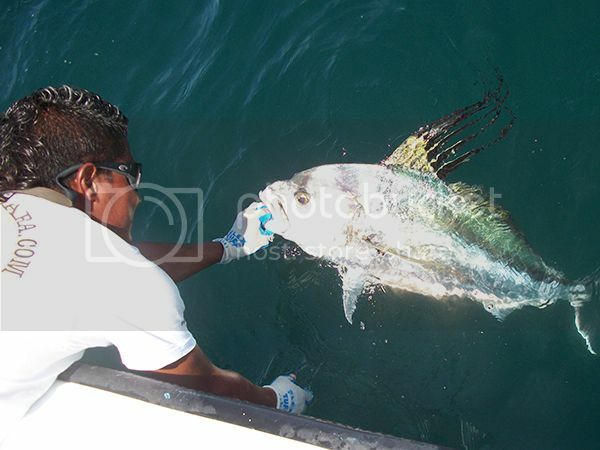 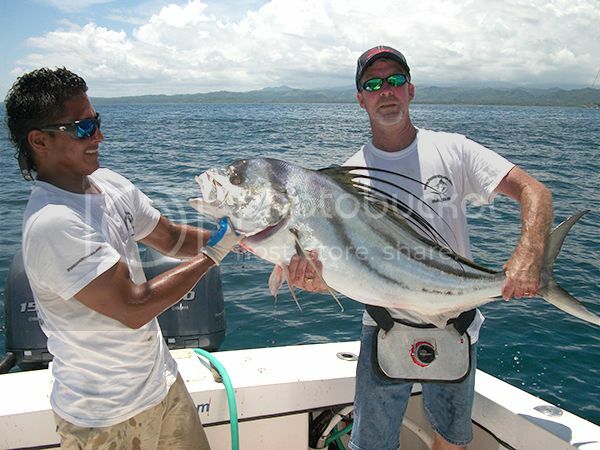 Later in the trip they repeated with a Rooster Fish release followed up with another Cubera. 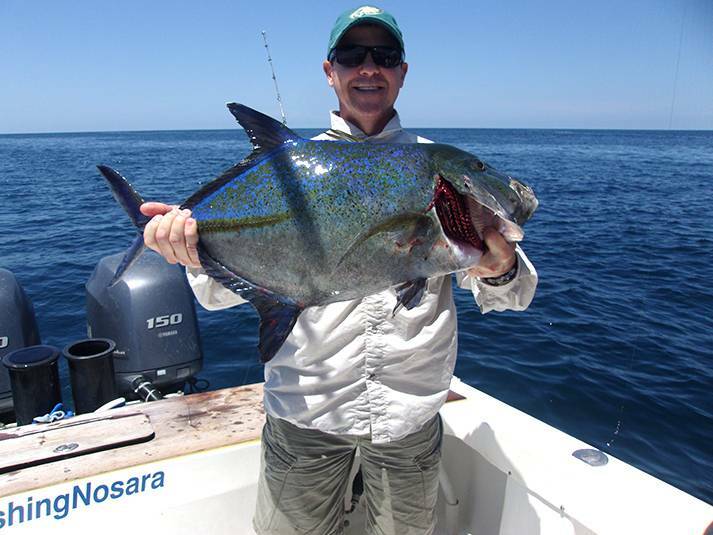 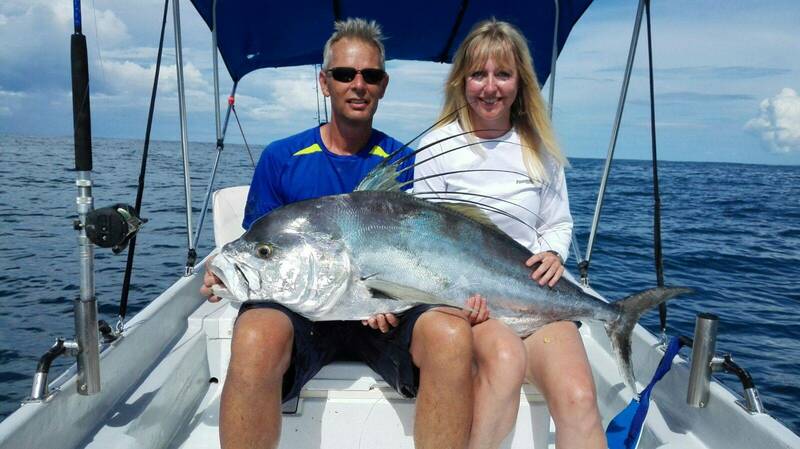 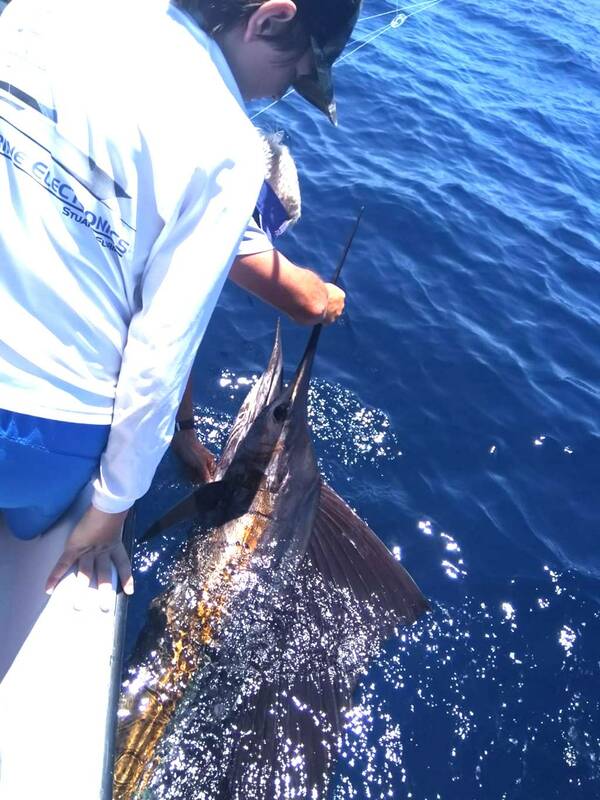 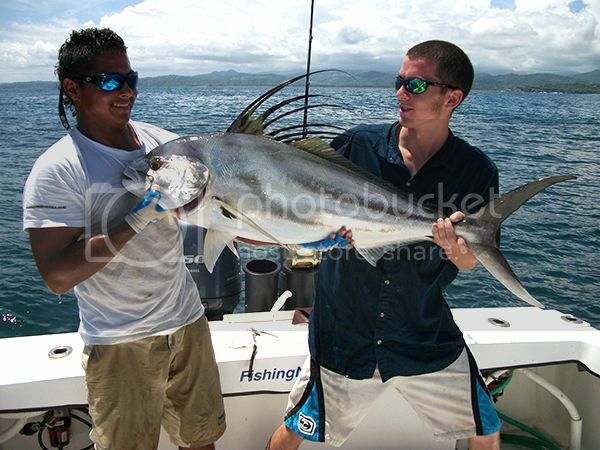 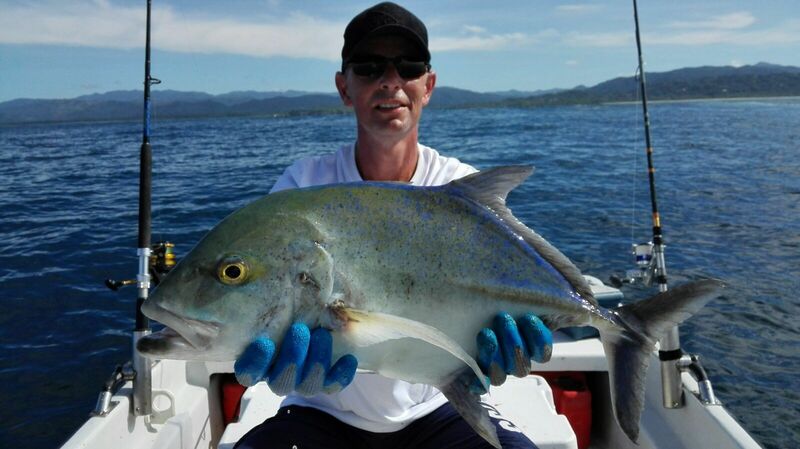 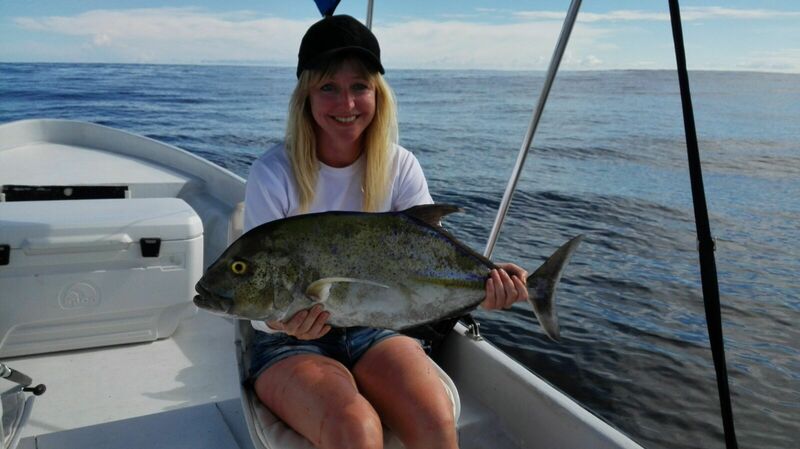 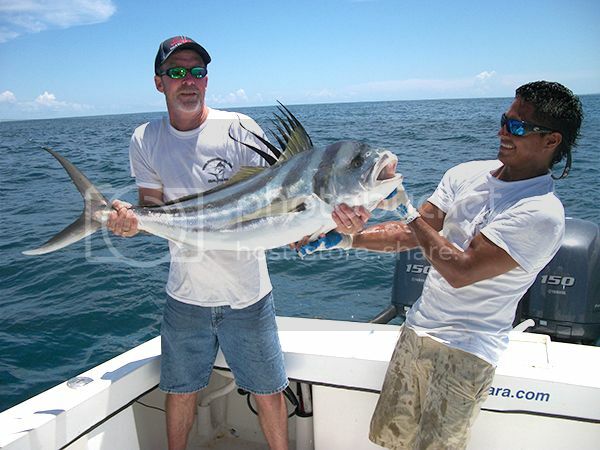 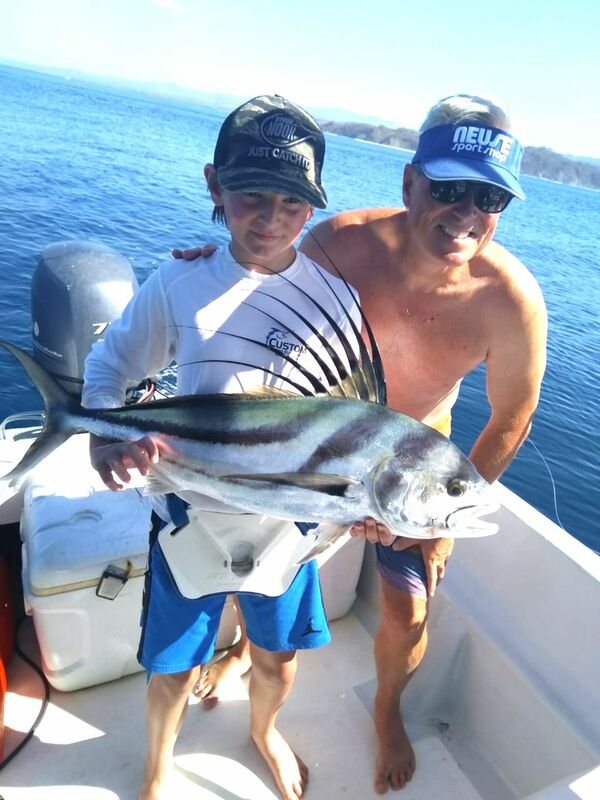 The reefs have been fertile all month, but rarely do we get two massive Rooster Fish releases AND two Cubera Snappers. 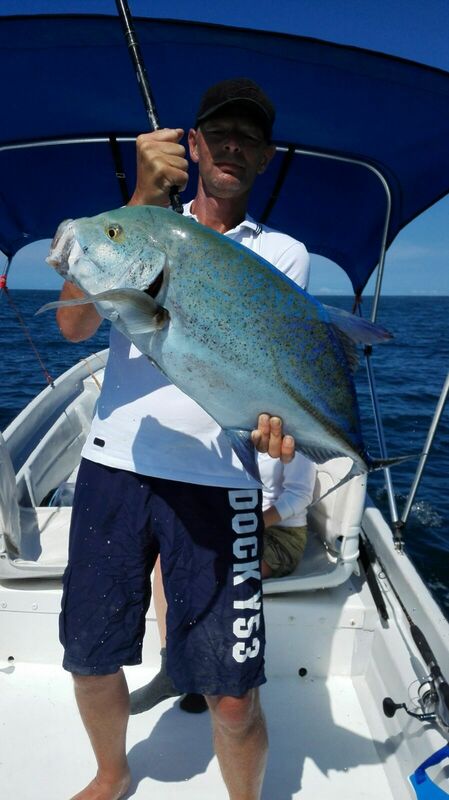 As an added delicacy, check out this Blue Jack Crevelle…this is a rare catch for our area and is the first of the year for the whole team. 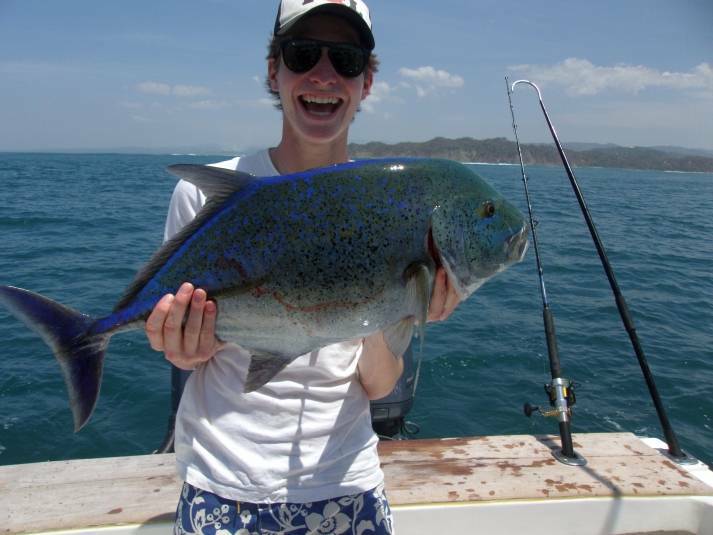 This tasty specimen is excellent table fare and it is unusual to see one of this size. 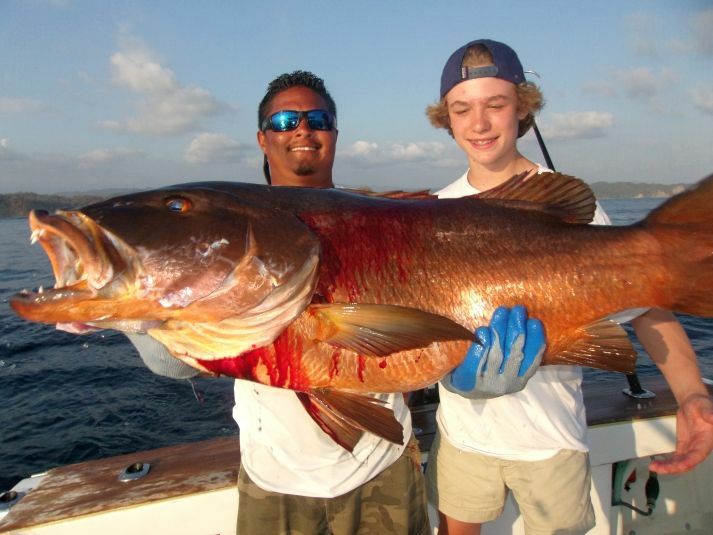 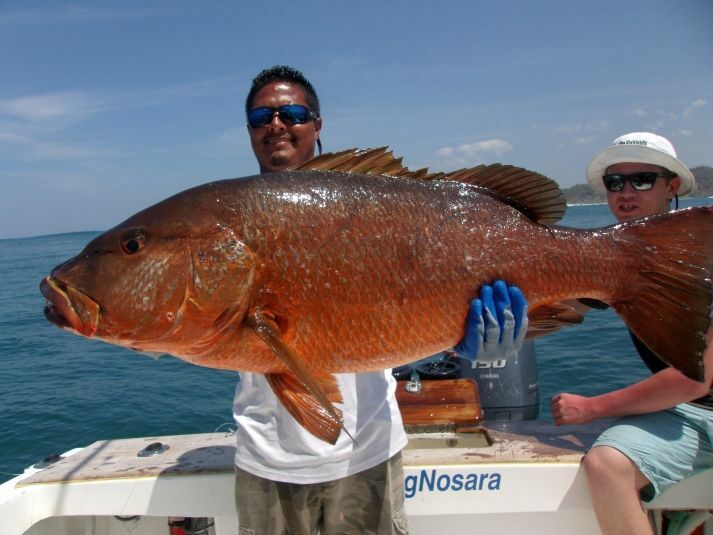 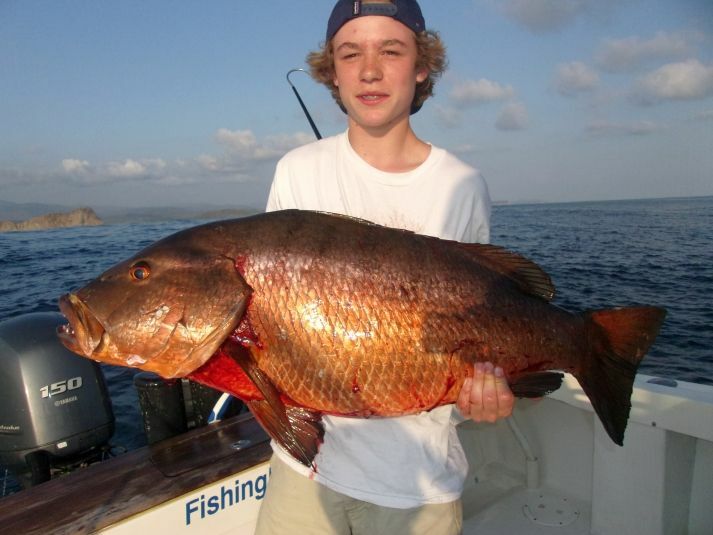 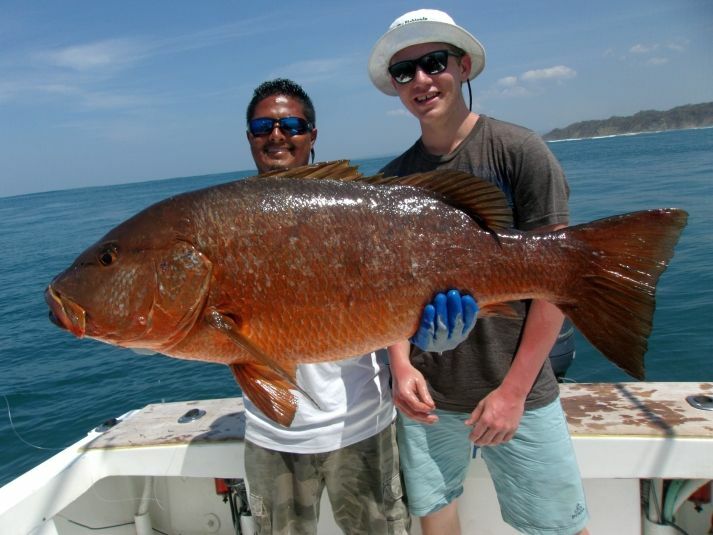 Now that is a monster of a trophy fish! 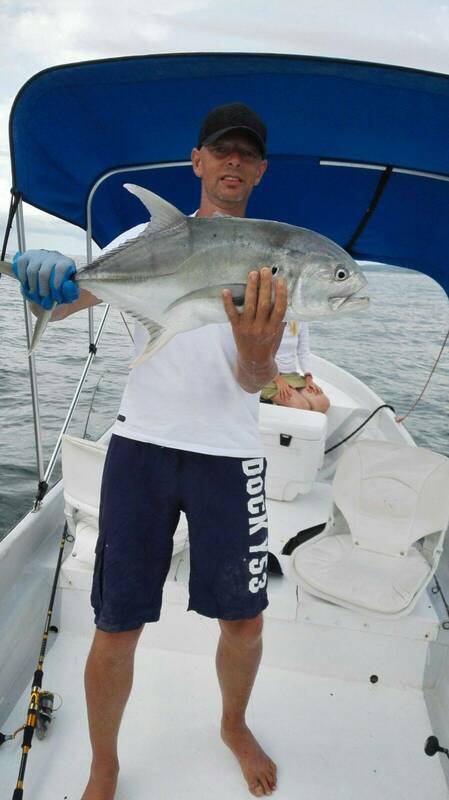 Great work by First Mate Alex to safely released this treasure. 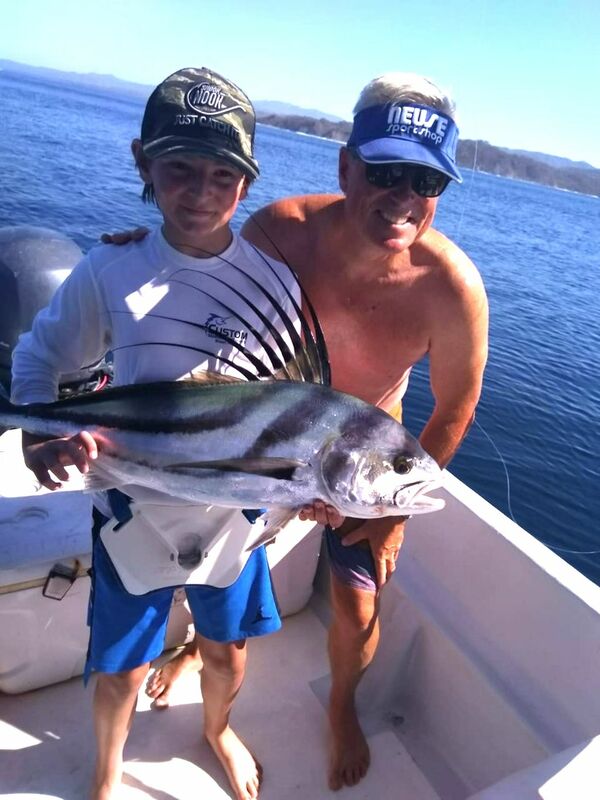 Waynes Estes and his son Trevor were back on the Wanderer today and were determined to hunt the reef dwellers. 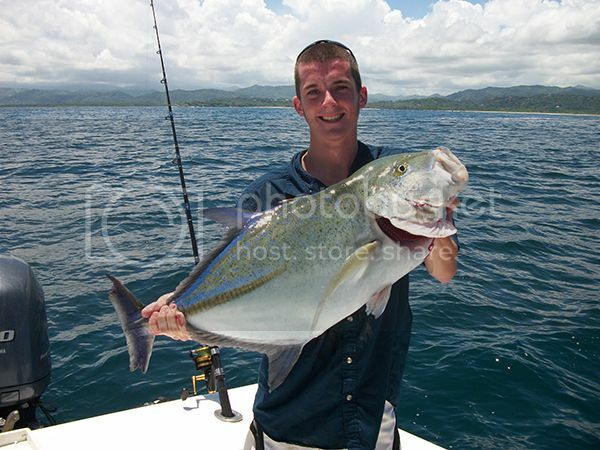 Trevor caught the first fish of the day, this rare and elusive Blue Jack Crevelle. 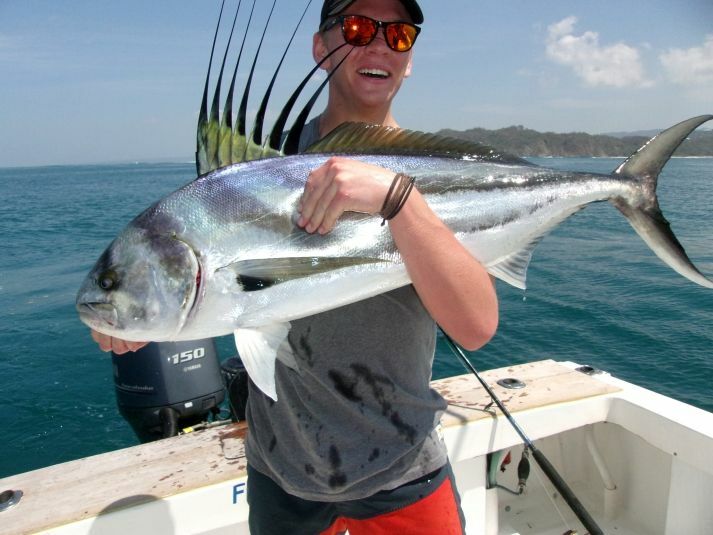 In fact the Jacks were thick all day as the Estes’ boys mopped up the Crevalles. 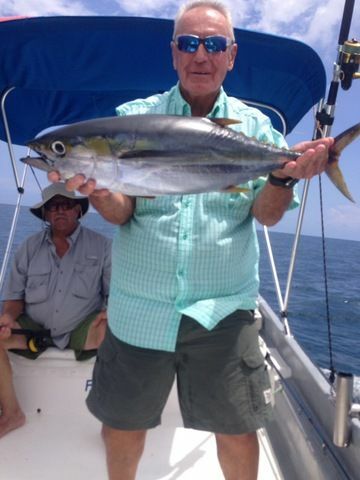 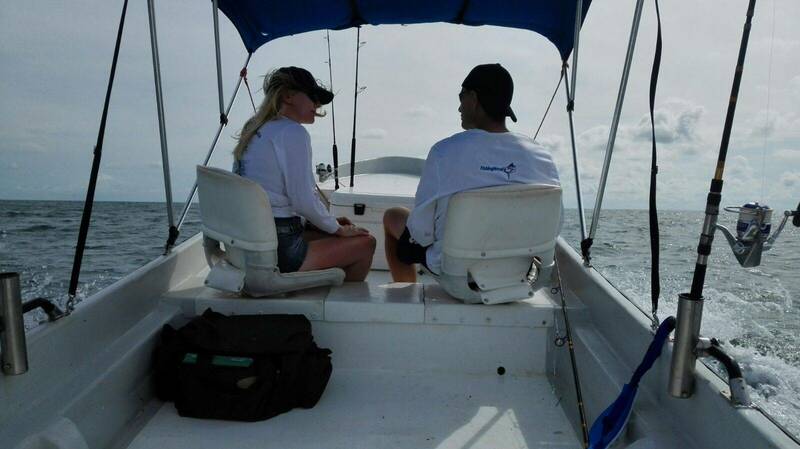 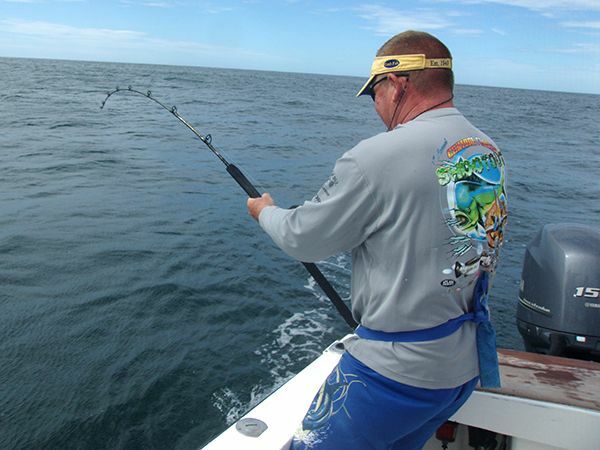 Check out Wayne’s old-school FishingNosara T-shirt…this ain’t no first timer folks! 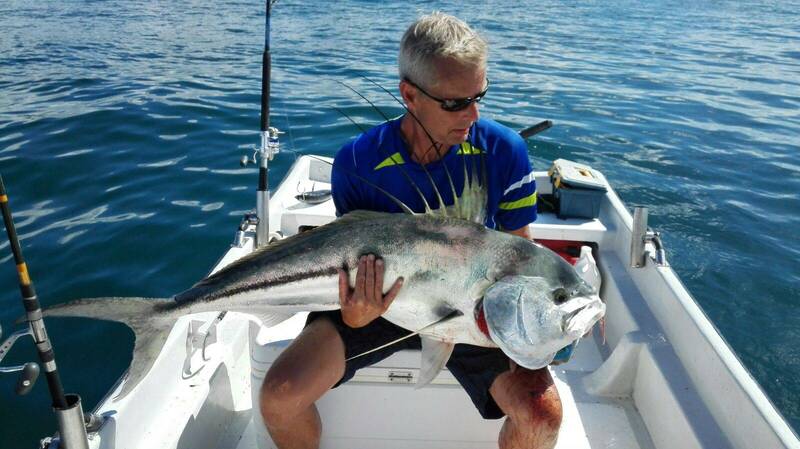 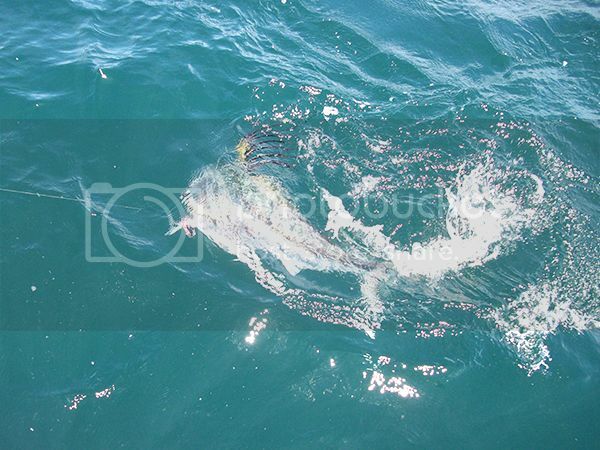 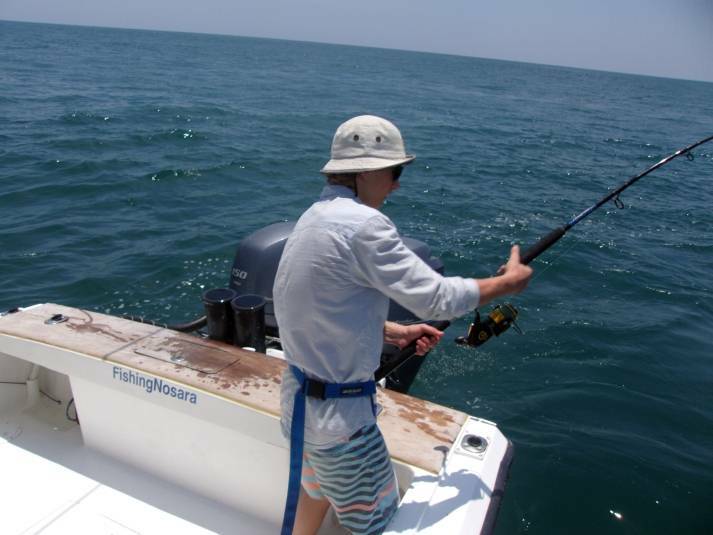 The action heated up in a major way in the afternoon as not one, not two, but THREE Roosterfish found the hooks. 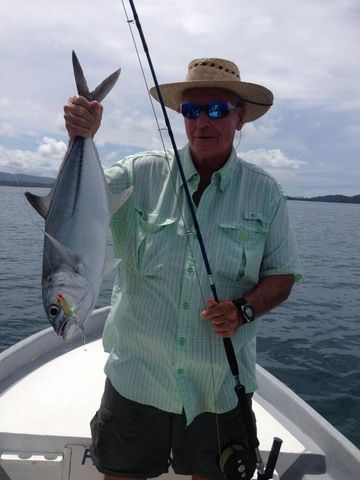 This comes on the heels of the Wanderer‘s double Rooster day last week. 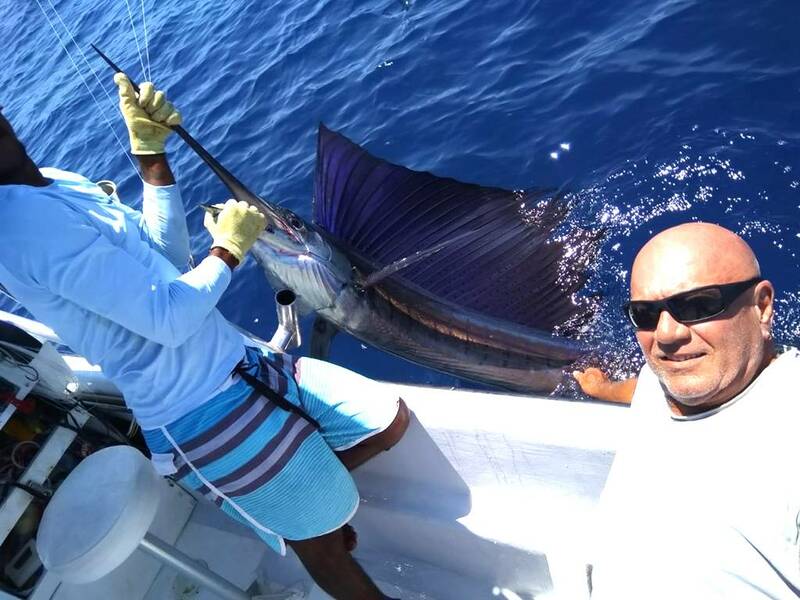 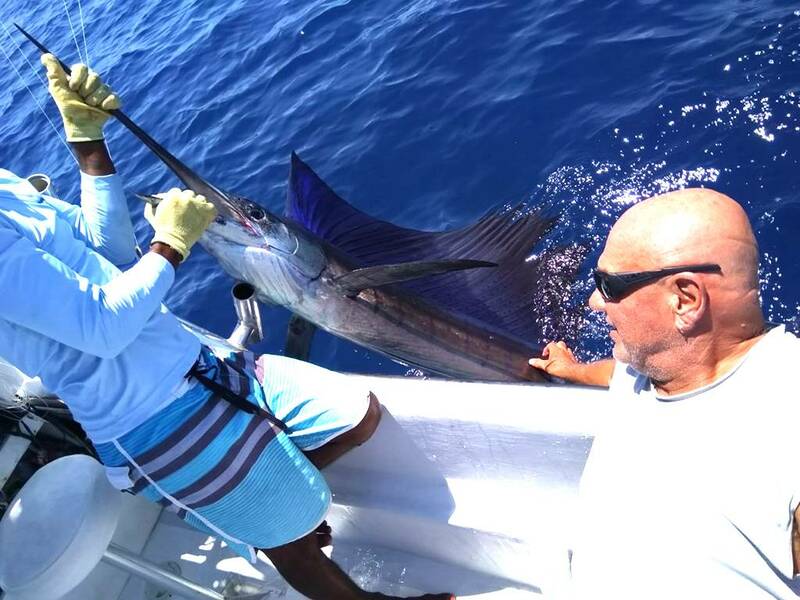 Fantastic work by this Jacksonville-based Father and son fishing team! 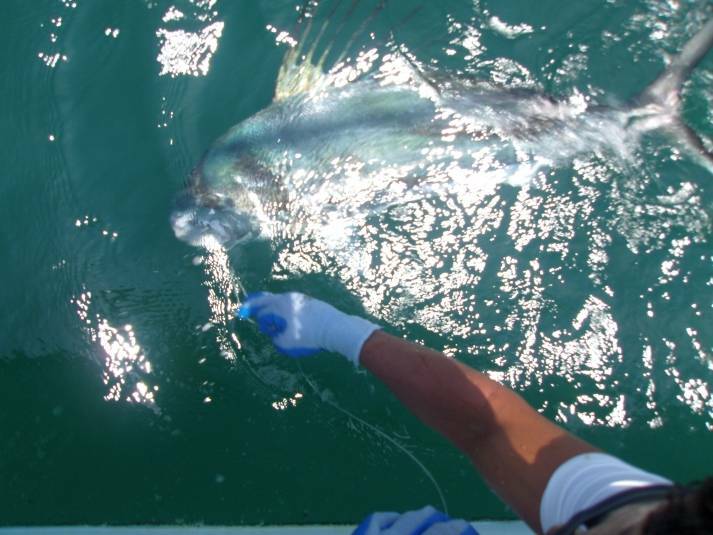 All three pez gallo were released safely and we look forward to catching them many more times.